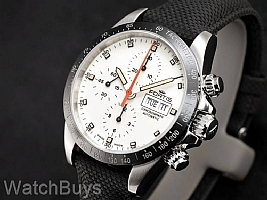 A pilot's watch in the Fortis Cosmonautis line? It's no mistake, the Stratoliner series is designed to handle the rigors of flights in Earth's stratosphere, 15-50 kilometers above sea level, thus their inclusion with the Fortis space watches. Dating back to the early 1960's, the Stratoliner collection has been used by pilots during reconnaissance flights, oftentimes flying in altitudes of 20,000 meters and above. The Fortis Cosmonauts Stratoliner Chronograph Ceramic AM features a 42 mm case with complete chronograph functions. The dial is silver in color (hence the AM in the name) and is coated with beige SuperLuminova. The hour, minutes and seconds hands are trimmed in black. Accentuating the dial are applied numerals and indices. Screwed pushers drive the chronograph, which features a bright orange central chronograph hand and subdials at 12 and 6. The matte black ceramic bezel complements the case design and finish, providing balance to the watch as a whole. Integrated into the bezel is a tachymeter which can be used for speed calculations. This watch is fitted with a Fortis black calf leather strap with Fortis signed tang steel buckle. 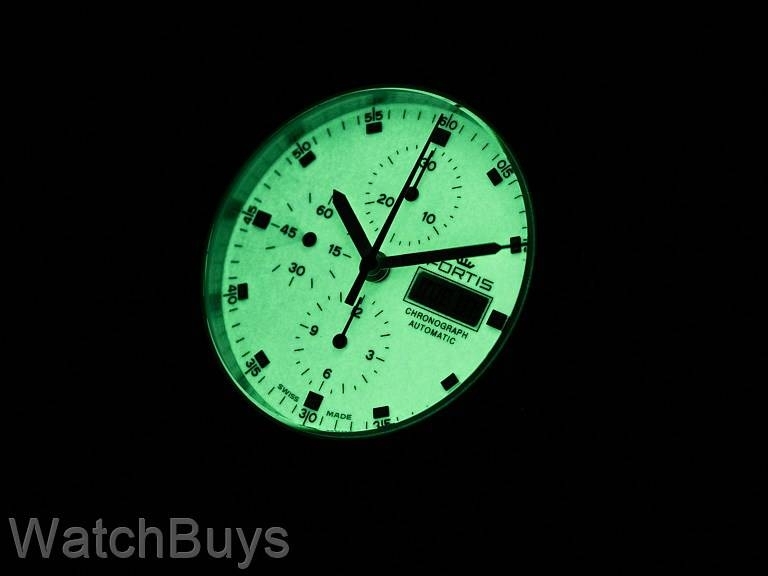 "It’s All About The Lume"
Verified Owner Comments: I had seen pictures of the all-lume dial on this Fortis am Ceramic Stratoliner and wanted to own it. It is very cool looking and I am very pleased. The other features of the watch are typical of Fortis. This is a solidly built reliable and unique looking chronograph that is a tremendous value. The new Fortis designs are well done. Verified Owner Comments: I first saw this watch in the Fortis catalog called Watchbuys and ordered it! The staff at watchbuys was very helpful, and patient, during the process (I requested numerous pictures). The simple, but elegant white dial surrounded by the black ceramic bezel is striking. Night time lume is just plain fun! Ordered it with the steel braclet but switch to the black strap its best suit. Only wish is that it had a screw down crown. Screw down chrono buttons are a nice touch. So far it has been very accurate +4 seconds a day. Running the chronograph at night slows is back to within a second by morning.